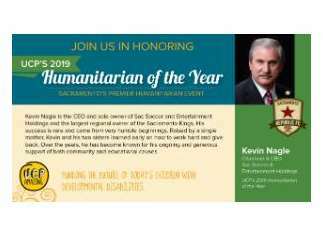 The Foundation for UCP of Sacramento and Northern California will honor Mr. Kevin Nagle as its 2019 Humanitarian of the Year at a dinner in May. UCP selected Mr. Nagle in light of his unique and diverse contributions as a business executive and philanthropist. The award dinner is UCP's largest fundraiser of the year to support UCP's range of programs and initiatives to empower individuals with development disabilities. Mr. Nagle is currently Chairman and CEO of Sacramento Republic FC, leading the team's pursuit of a Major League Soccer (MLS) expansion club and downtown MLS stadium. He is the largest regional owner of the Sacramento Kings. As a philanthropist, Mr. Nagle has donated millions of dollars to a variety of charitable organizations in the Sacramento region promoting health, education, youth development and the arts. He is the Board Chair of Saint Mary's College of California, Board Member of St. HOPE Public Schools, Board of Advisors member of the UC Davis School of Medicine, and a Founding Member of the Greater Sacramento Area Economic Council. For more information about the dinner, visit http://ucpsacto.org/news-events/humanitarian-dinner/.